The two-colored serial number has four red and six black characters. The size of the characters becomes gradually smaller from the middle to the left and right sides. Hold the note to light and look for the watermark, similar to the lotus flower. The watermark is part of the paper itself and can be seen from both sides of the note. On the obverse of the note you can see holographic magnetic windowed security thread. The value can be seen in tiny letters on the stripe. 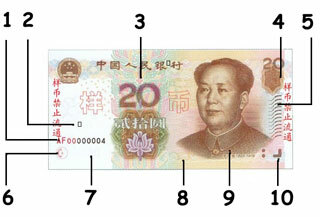 When the banknote is viewed from a certain angle, the number "20" appears at the top right of the note. Lines printed in the right of the 20 Renminbi/ yuan note, made by intaglio printing feel raised. When held up to the light, front and back elements combines perfectly. White denomination watermark appears when you hold the banknote against the light. The letters, 'RMB", and the numeral, "20" can be viewed with the help of a magnifying glass under the portrait of Chairman Mao. Symbols for visually handicapped are applied by intaglio printing on the obverse side lower right corner of the 50 China Renminbi/Yuan note. 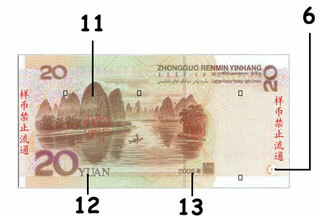 Year of issue appears on the reverse of the banknote.